Versace purses, Capodimonte vintage porcelain, rare Cavalier vintage projector, antique wheelchairs and merchant barrels, Stiffel lamps, jute woven rags, Royal Selangor pewter plaques, wooden butcher BOOS tables and rocking chair interior decor elegant items offering a vast choice of items. CAVALIER DeLuxe movie projector Model 660A. Vintage elegant wooden mirror with bevelled glass. Vintage 14K white gold chain with silver tone glass stones accented solid, sideway design, beautiful heart pendant. 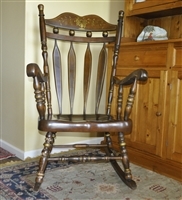 Huge Ethan Allen metal cast statue on round base in wood grain like finish from 1982. 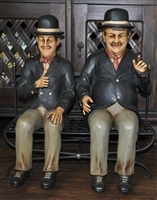 Vintage Laurel and Hardy or Stan and Ollie figurines sitting on the bench silent movies stars. 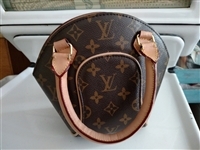 LOUIS VUITTON canvas Ellipse PM bag made in France. Guan Gong pewter Plaque by Royal Selangor. Vintage Boos Block butcher table on longer legs. STIFFEL Hollywood Regency table lamp with glass tray. Hand woven Jute rope like fabric vintage rug with elephant centerpiece design. 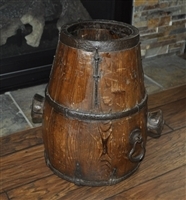 Primitive Asian Merchant wooden rice bucket.